The politically incorrect truth is that if you don’t deliver results, you’re going to have unhappy bootcampers. … until you give them an amazing experience with every single workout. But that can be really tough and you don’t have the time to create fun and challenging workouts day in and day out. Now you can give your campers an amazing experience with every workout with these addicting bodyweight density finishers that can be added to ANY bootcamp workout. Simply plug in these addicting density finishers to challenge your bootcampers and help them drop fat FASTER than long, boring cardio. P.S. There is NO RISK at all for you to try this Metabolic Finisher program. 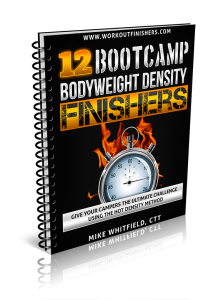 If you are not thrilled with Bootcamp Bodyweight Density Finishers in 60 days, let us know and we’ll refund every penny. Your satisfaction is 100% guaranteed. My workout programs have already been seen on Men’s Health, Turbulence Training and used by thousands of men and women, and I guarantee it will work for you, too.